Cognac glasses are essential for drinking one of the most luxurious alcoholic beverages on the market. Not only do they exude class and elegance, but they’re also the perfect addition to your bar. If you’re looking for the perfect gift for a high-class man in your life, our selection of stunning cognac glasses are sure to be a hit. As one of the most well-known and sought after brands that create plenty of glassware, the Riedel set is simple but beautifully designed. They’re the type of glasses that you can either use regularly or have displayed on the top shelf in your cabinet. These come in a set of two and they are machine-made out of leaded crystal. You’ll appreciate the quality as they are made with high attention to detail so that you get the largest capacity possible in a sleek and streamlined design. This set of glasses is also a pricey gift, which makes them perfect as a retirement or wedding gift. 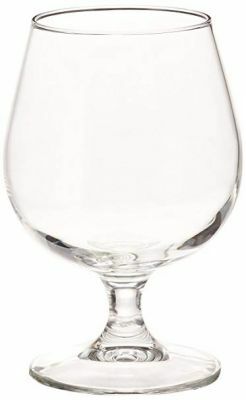 If you’re in the market for cognac glasses that are a little more affordable, we highly recommend the Libbey Craft Spirits glasses. They come in a set of four glasses and have a similar style to the Riedelset. The sturdy stem of these glasses is something to note as well as the smooth bowl that is easy to cradle in your hand. 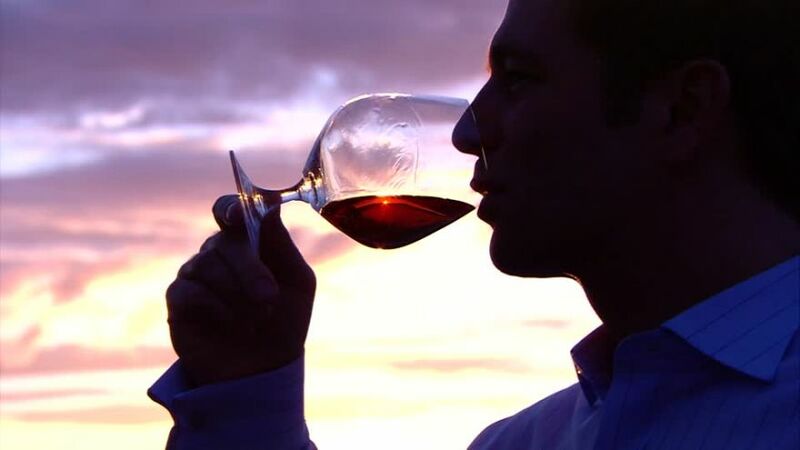 Your cognac will easily be able to release its best aromas within a matter of minutes. Additionally, each of the glasses is made from lead-free materials. There are four 12-ounce cognac glasses in the set that is highly durable and machine washable, which makes it much easier to clean up after a get-together or dinner party. 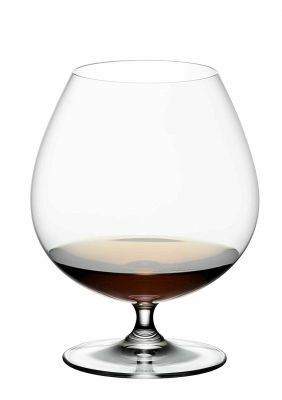 As another set of cognac glasses developed in Europe, the Bormioli Rocco Riserva glasses are a beautiful option. There are a variety of different glasses to choose from if you’re looking for more than cognac glasses, as you can also choose Bordeaux glasses, Cabernet glasses, Champagne glasses, and more. In the set, you will receive six 16.5-ounce cognac glasses that feature a stunningly transparent lead-free crystal bowl and stem. They also have a similar design to the other glasses available in the Riserva collection, as well as the Nadia collection. Unlike the Libbey Craft Spirits Cognac Glasses, this set should be hand washed and handled with care. 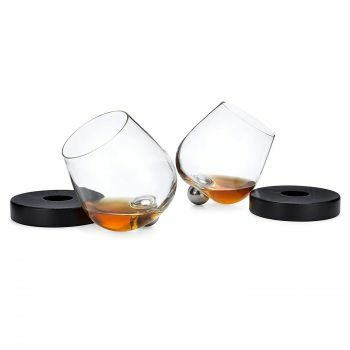 Ideal for a more traditional man, the beautifully designed Russian Cut Cognac Snifters works perfectly with decanters and other glasses that you might already have. They are surely one of the more elegant designs on this list and are highly recommended for a classic man. There are six glasses in the set that is useful for whiskey, brandy, scotch, and cognac. 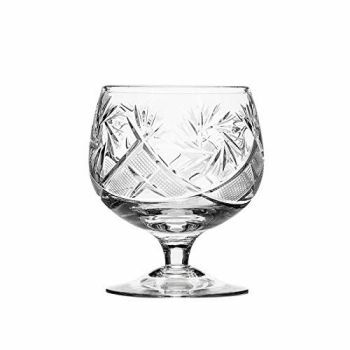 Each glass has been hand made and cut entirely from crystal so that they feature a 10-ounce bowl. They will surely look stunning on the dinner table or displayed delicately in your cabinet. 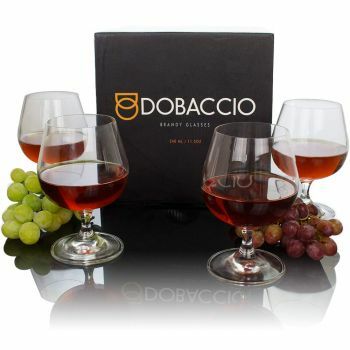 The Dobaccio set has a more modern design compared to the Russian Cut Cognac Snifters and it will come in a pack of four. They are also prepackaged in a beautiful display box, so all you will have to do is wrap the present once it arrives. Each of the glasses has a beautiful shape that emphasizes refinement. The short stem is ideal for aerating your beverage, whether you prefer it mixed or neat. The bowl is also easy to hold to help warm the aromas within the cognac. All of the materials used to make the glasses are eco-friendly and lead-free, so you’ll have the safest drinking experience possible. Additionally, they are dishwasher-safe, which cuts back on the amount of time it takes to maintain them over the years. As the most modern pair of cognac snifter glasses on this list, the Aura glasses are surely our favorites. They’re something that your friends and family will be impressed by as they are uniquely designed and look fantastic when displayed. The glasses have a no-spill design that you might have seen before and they look absolutely phenomenal when displayed. On the bottom of each glass, there is a stainless steel ball that prevents the glasses from tipping over and also gives you the ability to easily spin the glass. In addition to the set, you’ll also receive two wooden coasters that the stainless steel ball fits into. They fit comfortably in the palm of your hand and you won’t have to worry about ever spilling your drink. The glasses feel particularly heavy-duty in your hand and are made out of top-shelf lead-free clear glass. It truly is the type of gift that the recipient will not only appreciate but will also use regularly. With the ornate design of these glasses, they are sure to stand out amongst the other cocktail glasses in your bar. 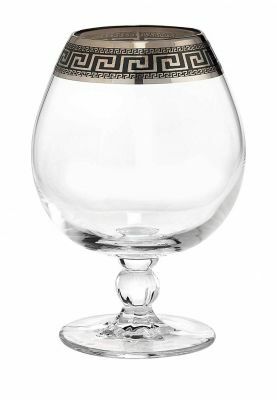 The Cristalleria Italian Décor goblets are handmade in Italy and feature unique attention to detail that is akin to ancient Greece. Around the rim of the glasses, you’ll notice a silver platinum Greek Key pattern that you can also see through the glass. You can also opt for gold instead of silver, depending on the style of the special man in your life. In the set, you’ll receive six glasses that are 17 ounces each and they come with a specialized nested gift box. It’s a beautiful gift for retirement, a wedding, or even a housewarming party. 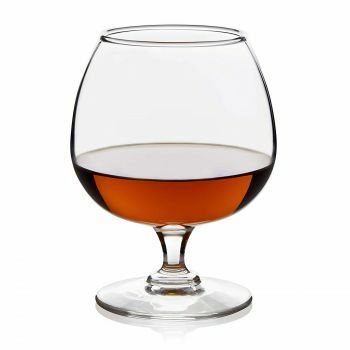 Finding the perfect cognac glasses is easier than you might think! There is surely a set out of these seven designs that the special person in your life will love to have. In addition, they all look fantastic when displayed at your bar or in a special cabinet in your home.